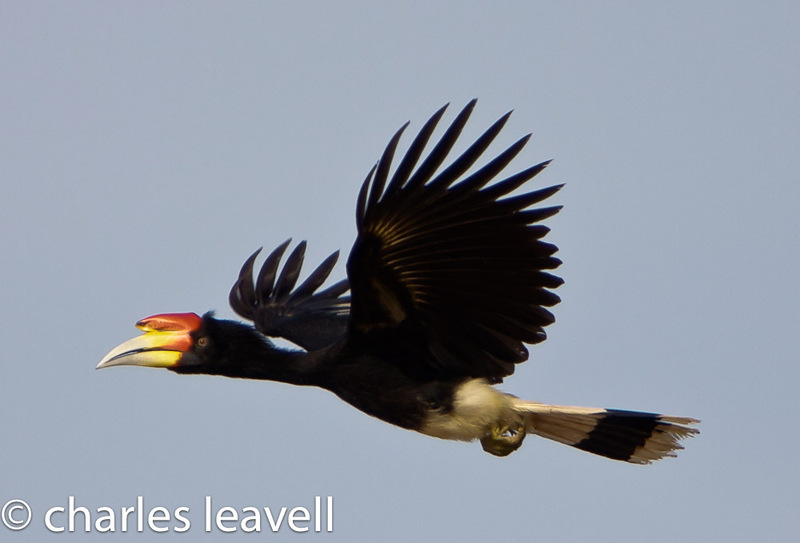 Not a helicopter – but a hornbill! Rhinoceros Hornbills are among the largest of the world’s 54 species of hornbills, which are spread across Africa and India to Asia and New Guinea. Some hornbills eat mostly fruit. Others are carnivorous, snapping up lizards, small mammals, and birds. Most live in mature, tropical forests, but some are desert dwellers. And a few species spend nearly all their lives on the ground, even though they are strong fliers. When a hornbill does fly, the powerful strokes produce a rhythmic thrumming. 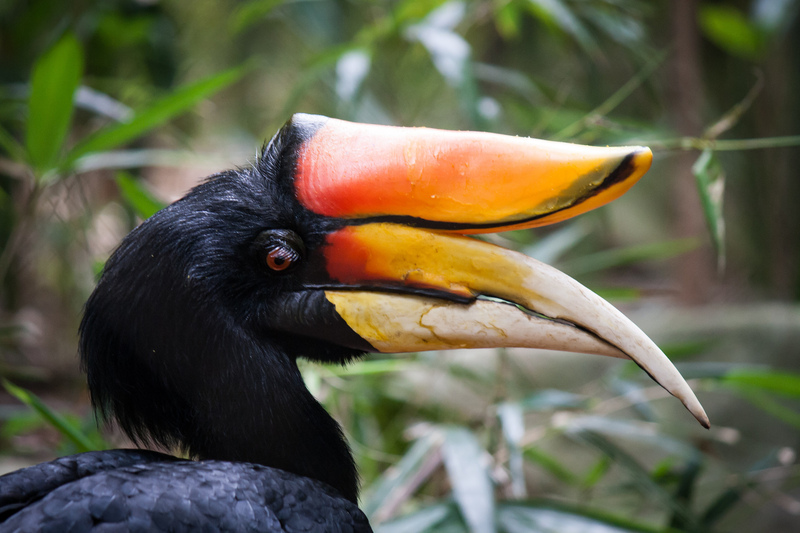 Not a helicopter – but a hornbill. A brisk, rhythmic thrumming carries through the forest in Borneo. What sounds like an approaching helicopter are actually the wing-beats of a remarkable bird called the Rhinoceros Hornbill. It’s hard to talk about a Rhinoceros Hornbill without resorting to superlatives. [Rhinoceros Hornbill call, http://macaulaylibrary.org/audio/6675, 0.05-.07] For one thing, it’s nearly four feet long yet flies nimbly among the trees. Feathered mostly in black, it has an outlandish, down-curved, yellow beak shaped like that of a toucan. Rhinoceros Hornbills are among the largest of the world’s 54 species of hornbills, which are spread across Africa and India to Asia and New Guinea. Most live in mature tropical forests, but some are dessert dwellers. And a few species spend nearly all their lives on the ground, even though they are strong fliers. And when a hornbill does fly, the powerful strokes produce that rhythmic thrumming. [Rhinoceros Hornbill wing sounds in flight: http://www.xeno-canto.org/284705] Not a helicopter – but a hornbill. Bird sounds provided by The Macaulay Library of Natural Sounds at the Cornell Lab of Ornithology, Ithaca, New York. 6675 recorded by Andrea L Priori. BirdLife International has still more!